The information provided in this article is aimed at improving education and clarification on the civil use of government aerodromes. 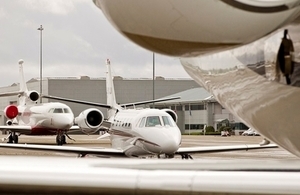 Private jets at RAF Northolt airport. MOD Crown copyright. The Military Aviation Authority (MAA) recently co-ordinated activity whereby Civilian Aviation Authority (CAA) Aerodrome Inspectors audited RAF Northolt and RAF Brize Norton from a ‘safe place to operate’ perspective. These audits were specifically conducted in order to assist the CAA in meeting their responsibility to maintain an appropriate level of safety regulatory oversight on the conduct of civil aviation activity taking place at Government Aerodromes in the UK. To read the full article click on the pdf document below.